Brother Hugo is a monk who must return his library book of Augustine’s writings. The problem is that he cannot return it; a bear has eaten it up and thinks Augustine’s words are so sweet he wants more! Brother Hugo enlists the help of the other monks to prepare a new copy of Augustine’s writings, using a goose feather, soaked nutgalls, and a pen knife. Every day, Brother Hugo sits in the scriptorium and writes and writes. When he is done, Brother Ralph brings him a needle to sew up all the gathered pages. With the beautifully finished new copy, Brother Hugo must travel to the Grand Chartreuse library, but he must watch out for the bear who is snuffling behind him, eager to eat the sweet words of Augustine! This book’s author, Katy Beebe, has thoroughly researched medieval manuscripts, and her book is a delightful and informative tribute to the process of creating and preserving them. Anne Rankowitz, student at Union Presbyterian Seminary in Charlotte and Director of the Resource Center for Charlotte Presbyterian and UPSem, shares her favorite book of 2014. You’ll see plenty of other book reviews from Anne in 2015. 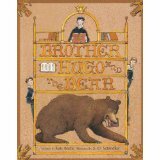 Advent Gifts: Brother Hugo and the Bear by Storypath is licensed under a Creative Commons Attribution-NonCommercial 4.0 International License. I thought I had found every book about illuminated manuscripts for children. I can hardly wait to find,read,and share this one. Thanks, Anne.